MVS Studio provided a custom touchscreen photo booth for the Katy Perry Prismatic world tour. Custom graphics incorporated the design of the tour into fun giveaways for fans backstage. Using our experience in designing custom branded experiences we developed a booth that could travel durably, was able to devlier images instantly to fans for social sharing and provided a branded print right on the spot. And one more thing…it had to be really easy to use and setup on each leg of the tour. A custom solution that is plug and play? That’s our specialty! Katy Perry’s Prismatic booth was a modified Xioto, with new software installed to enable instant sharing and to crop the photobooth shots into the “Prismatic” overlay. We designed the booth to be easy to use, with a custom user interface that enabled users to select black and white, color or prismatic filters on their shots. Images were delivered instanly when the booth was connected to a wi-fi connection. 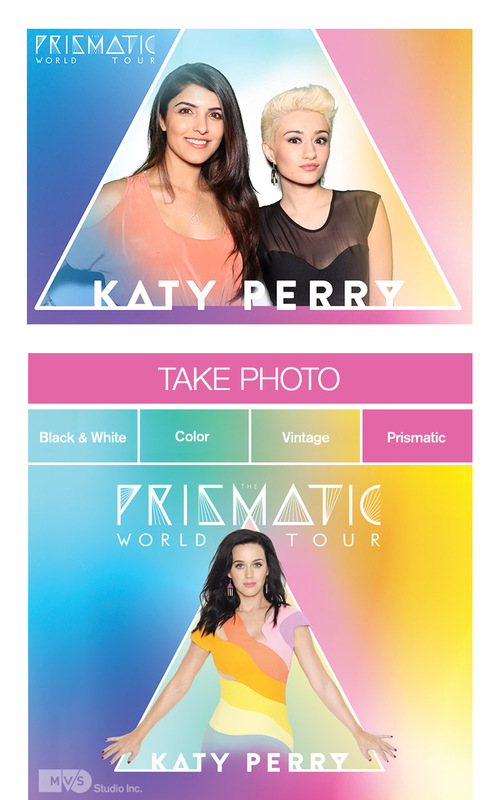 Katy Perry Prismatic photo booth user interface. Easy selection, instant sharing and prints and a cool custom look to mirror the design of the tour. Do you have a series of events coming up and you would like to give your fans or customers a unique branded takeaway? Want your message to live on in social? Fill out the form below, we would love to design a photo activation that helps you stand out! Mindy Kaling & Rhea Perlman!